"My favorite sports pub serves this, and I've come up with a simple and delicious home version. Many local restaurants sell wing sauce, and most grocery stores carry it near the steak and BBQ sauces. It's rich, so serve in squares as an appetizer. Serve ranch dressing, celery, and carrot sticks on the side. Enjoy!" Preheat oven to 475 degrees F (245 degrees C). Line a baking sheet with aluminum foil. Place pizza crust on the prepared baking sheet. Mix chicken and 3 tablespoons wing sauce together in a bowl until evenly coated. 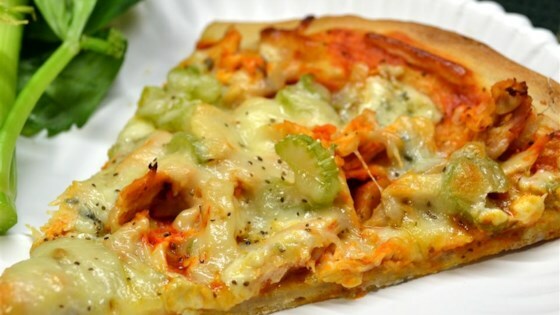 Spread 1/2 cup wing sauce on the pizza crust; top with blue cheese, chicken mixture, and celery. Cover pizza with mozzarella cheese. Bake in the preheated oven until pizza is cooked through and cheese is bubbling, about 12 minutes. Cool pizza about 5 minutes before cutting into squares. Made this for a SuperBowl party this last weekend. Flew off the table. Used Franks hot sauce and added butter and garlic powder. Also added more chx and sauce. Excellant!